Officers will then investigate and make contact with the registered keeper to take appropriate action where possible. Members of the public can submit (via a secure online form – https://www.nextbase.com/en-gb/national-dash-cam-safety-portal/) digital footage showing potential traffic offences. This can range from driving dangerously or carelessly to overtaking on solid white lines, using a mobile phone while driving, ignoring traffic lights or dangerous driving around other road users, such as horse riders and cyclists. 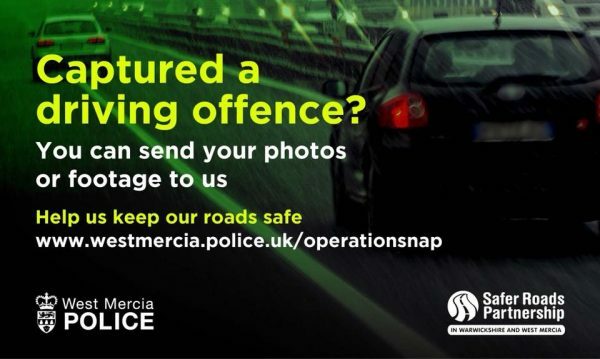 Your submission will be sent to West Mercia Police where the evidence will be reviewed by one of their road traffic officers, who will enforce against any offences committed. Any footage submitted through the portal can also be used by the Police to help educate other road users and to advise on case results. Please regularly check your CCTV footage, you might spot suspicious activity that might be preparation for an illegal activity. If you get a telephone call from someone offering home security with an alarm that links you to the police, put the phone down, dial 1471 to get their number and report to the police, tel 101. A resident in the village has received one such call….it was a SCAM. Please warn your elderly & vulnerable neighbours. The Bromsgrove District Plan 2011-2030 is being reviewed. The current Bromsgrove District Plan (BDP), which was adopted in January 2017, forms part of the statutory development plan for the district, it sets out the Council’s vision and strategy for the area until 2030 and provides the basis for decisions on planning applications. The current adopted Plan only allocates enough land to provide 4,700 of the 7,000 dwellings required to meet the District’s need for the 2011-2030 period. The Council recognises that there may be a need to assist with the identification of land to meet the housing shortfall within the wider West Midlands sub-region. The plan is usually reviewed every 5 years. It is preferred that you make your representation on this official comments form online here. It is important to specify which part of the document you are commenting on. Police and Crime Commissioner John Campion and Worcestershire County Council are giving members of the public the ownership to improve the safety of their roads as part of a joint campaign. Last weekend, at Sander’s Park in Bromsgrove, both organisations asked the county’s residents to let them know where they want the focus to be as part of the ‘Roads Focus’ campaign. The Commissioner and council want to give the public ownership to highlight where their concerns are. Be it installing white gates at the entrance of a rural village, putting up more signs to highlight young or elderly people crossing, introducing speed enforcement in a village or asking for other measures to discourage speeding. During a week of action, which will take place in November, the Commissioner and the council will start implementing some of the changes that have been suggested by the public. Those wanting to highlight concerns in their area can share their suggestions via https://www.surveygizmo.com/s3/4560444/Roads-Focus until the end of Sunday 7 October. Over the course of the campaign, more work will be carried out to improve the safety of Worcestershire’s roads and general road safety advice will also be given to ensure people remain focused when using the road – be it as a driver or pedestrian.